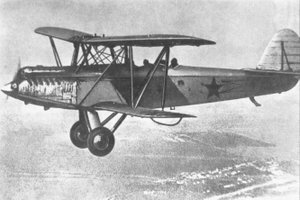 The Polikarpov R-5 was a Soviet reconnaissance bomber aircraft of the 1930s. It was the standard light bomber and reconnaissance aircraft with the Soviet Air Force for much of the 1930s, while also being used heavily as a civilian light transport, in the order of 7,000 being built in total. The R-5 was developed by the design bureau lead by Nikolai Nikolaevich Polikarpov as a replacement for the R-1, the copy of the Airco DH.9A which served as the standard reconnaissance and light bomber aircraft with the Soviet Air Force. The prototype first flew in autumn 1928, powered by an imported German BMW VI V-12 engine. It was an unequal span single bay biplane of mainly wooden construction. After extensive evaluation, the R-5 entered production in 1930, powered by Mikulin M-17s, a licence built copy of the BMW-VI, as a reconnaissance bomber. Further modified versions were produced to serve as floatplanes, ground attack aircraft and civil transports. The R-5SSS, an improved reconnaissance bomber with improved streamlining, served as the basis for the Polikarpov R-Z, which succeeded the R-5 in production. The aircraft was designed by Nikolai Polikarpov in 1928. 1,000 aircraft were manufactured for Aeroflot under the designation P-5. The aircraft was also taken into the Soviet Air Force's use in 1931. They operated 5,000 aircraft under the designation R-5. The R-5 became the standard reconnaissance and attack aircraft with the Soviet Air Force, being used in large numbers, with over 100 regiments equipped with the R-5. R-5s served with the Soviet Air Force and Mongolian People's Air Force during the 1939 Battle of Khalkhin Gol fought against the Japanese and, took active part in Soviet invasion of Poland (1939), and the 1939-40 Winter War against Finland, where they were known as the hermosaha ("nerve saw"). The Finns downed and captured several R-5s, but none were taken into operational service. They remained in service during the war against Germany in 1941-45, where they were mainly used as night bombers and liaison aircraft, serving until 1944. R-5s were also used by the Spanish Republican Air Force in the Spanish Civil War, 31 being sold to Spain. These arrived in November 1936, and were quickly deployed on combat operations, but were found to be slow and were relegated to night bombing. Seven R-5s remained in good condition in March 1939. The aircraft was known as the "Natacha" in the Spanish Republican Air Force. Civil versions of the R-5 were used in large numbers, mainly with Aeroflot. They were used to carry up to 400 kg (882 lb) of freight, with many being fitted with an enlarged rear cockpit to carry two passengers. Other aircraft were fitted with enclosed cabins for passengers. P-5s could also be used to carry underwing containers capable of carrying underwing containers (or Kasseta) for freight or passengers with one P-5 carrying 16 adults, including seven in each Kasseta. Ski equipped P-5s carrying Kasseta paid a key role in the rescue of the crew of the ice bound Soviet steamship Chelyuskin in 1934. Civil R-5s remained in service until after the end of the Second World War. Main production reconnaissance bomber. Initial production powered by M-17B engine, M-17F from 1933. 4,914 produced. Shturmovik. Ground attack variant. Additional gun armament. Twin float, reconnaissance seaplane. Also known as MR-5, MR-5bis or Samolet 10. 111 built 1934-35. Experimental engine test-bed, fitted with an enlarged rear cockpit to accommodate two observers. Also known as the ED-1. This experimental version was fitted with a M-34 engine. Single seat torpedo bomber with divided undercarriage to allow torpedo to be carried under fuselage. Improved version with reduced drag and increased gun armament. Also known simply as SSS. Increased performance. Over 100 built 1935-36. Light transport version for Aeroflot.M-17B engine. Approximately 1000 produced by 1940. Twin float version of P-5 - built in small numbers. Limuzin. Passenger version with cabin for two passengers. Built in small numbers in 1931. Revised passenger transport. Several built in 1933. Final modernised transport version. New semi-monocoque fuselage with enclosed cabin for four passengers. 210 converted for use by Aeroflot. Passenger monoplane based on PR-5. One built in 1938. Arctic exploration version with enclosed, heated cockpit and streamlined containers for payload faired into lower wing and sides of fuselage. Two built. Legkii Shtumovik. Light armoured attack aircraft - Modified design by Grigorovich. One built 1930. Tyazheli Shtumovik. Heavily armoured ground attack aircraft (6 mm armour) based on R-5, again by Grigorovich. Three prototypes. Refined derivative of Tsh-1 with new lower wings. Ten aircraft built. Light attack version with folding wings built for counter insurgency operations against Basmachi rebels in Central Asia. 30 ordered.